Enjoy all features of a music player combined with the professional quality settings of an equalizer and create unique music moments that match your style! Play your songs on an app based on a quality-focused design and enjoy an intuitive and friendly music listening experience. Discover your music as you have never seen! Thanks to the visualizer, watch the beats dance on your screen. Equalizer+ for Android enables you to modify the sound of your tracks thanks to a smart equalizer. 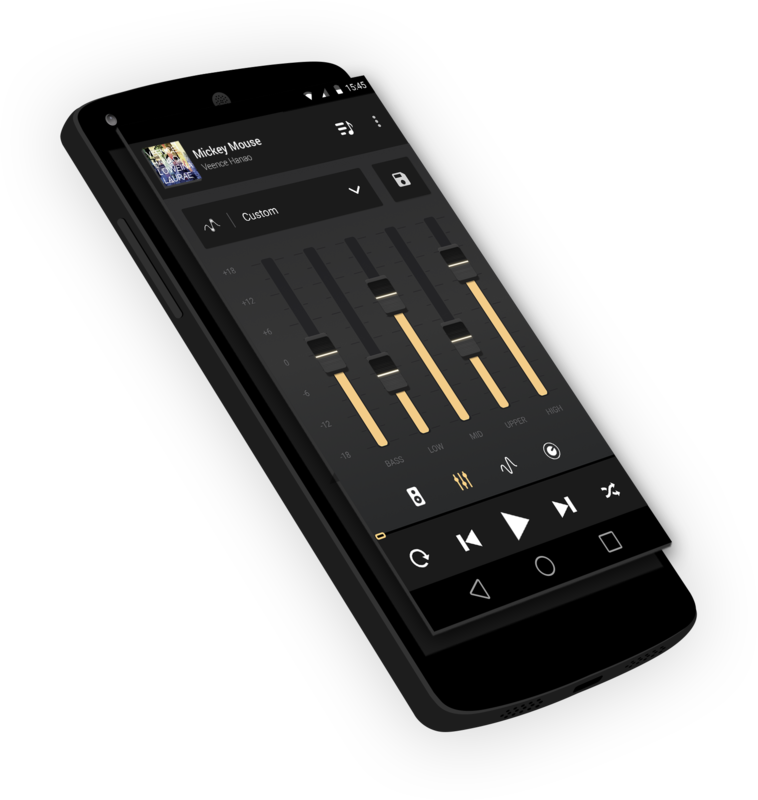 Equalizer+ for Android enables you to listen to your favourite songs that are located in the native Music folder of your device. The interface of the app has been designed to be intuitive for all Android users. Browse your music library by tracks, artists, albums or playlists and select the song your want in one click: all your songs are directly accessible from the app. Equalizing songs has never been easier! Discover new tracks thanks to a brand new feature: the network music sharing! Connect your device to the same wifi network as the one used by your friends and browse their music library to find new songs. This feature enables you to enlarge your music library without overloading your device storage. 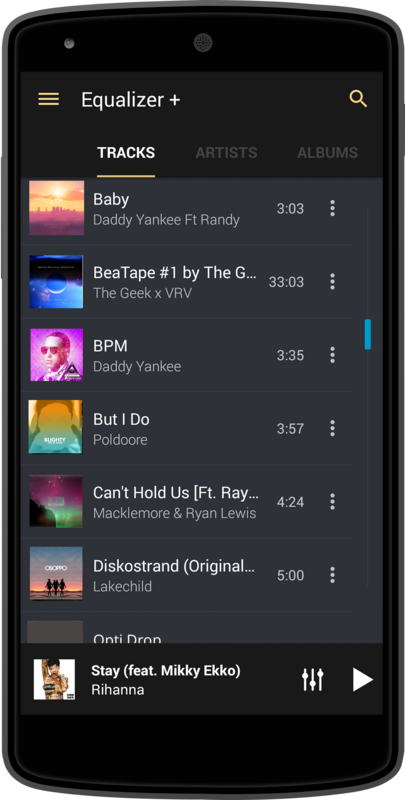 In addition, the network music sharing is probably the best way to discover and enjoy songs you may never have thought of. Your music library deserves to be played by a professional and intuitive music player. With Equalizer+ for Android, you can improve and boost the sound of all your songs in a simple gesture. As a pro DJ’s equalizer, enjoy the low, medium and high filters of any track. You can also modify the gain to create the perfect song! If you want to feel all the power of your music, bass boost it in a single click! "This app is perfect for my Skullcandy crushers. The music is so much better with this equalizer app"
"Equalizer+ is exactly what I was looking for. A simple way to adjust the sound"
"With this app I can both play my music and improve the sound easily. Great app"
Equalizer+ enables you to reinvent your songs thanks to all the possibilities of an equalizer. Enjoy a incredibly refined and easy-to-use interface without useless button. The app has been optimized to ensure a smooth navigation at home as well as in the street. Enjoy a vintage and flat design that matches your style! Modify the sound of your songs thanks to a five-band frequencies equalizer. In a simple gesture, increase the different filters – Bass, Low, Mid, Upper and High – and give to your tracks a brand new style. You have all the tools your need! Because we know many music lovers appreciate powerful sound, we created the Bass Booster feature. Switch the Bass Boost mode on and feel the difference. The best part of the whole experience is that you just have to click on one button! Access thousands of tracks thanks to the Network Sharing option: this feature enables you to access the music of your friends by connecting your device to the same wifi network. 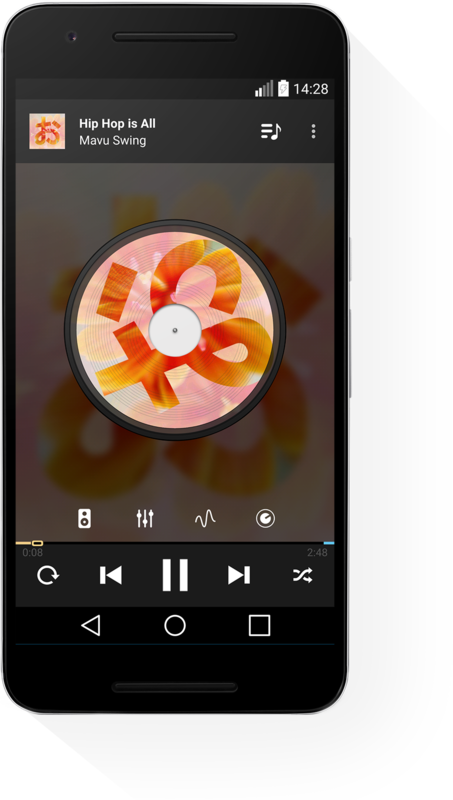 Equalizer+ for Android gives you the possibility to enjoy a limitless music library and share yours to your friends! The ergonomy of Equalizer+ for Android respects the new Google guidelines. The app has been designed with the material design that improve the user experience during animations and object’s motion. Equalizer+ guides the user’s attention with a visual continuity. Let’s enjoy a flexible, a meaningful and a beautiful browsing! Go to the Preset view and enjoy the best arrangement for your song. 10 presets are available which are based around different music genres, including all the usuals such as Electro, Hip-Hop, Jazz, Pop, R&B, Rock and many more. You can also create and save new customized settings! EqualizerPlus is a new way to listen to your music. Designed for everyone, the app is easy-to-use and enables all music lovers to tailor their songs to their taste. Eager to learn more about the App ? Check our Press Kit page! © 2016 Equalizer +. All Rights Reserved.